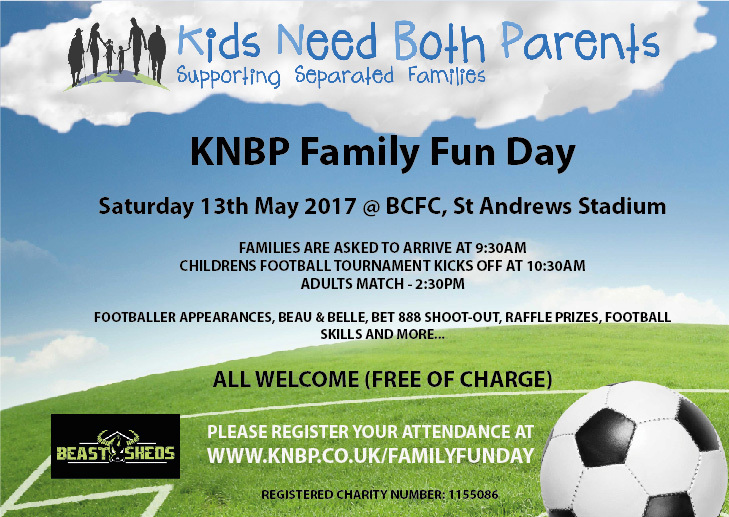 ‘Kids Need Both Parents’ are inviting you to enjoy a day full of football and family fun!! The day will take place on the pitch at Birmingham City Football Club, St Andrews on Saturday 13th May 2017. We kindly ask all families, players and spectators to arrive at 9:30am using Entrance 8A and the Away Car Park. The event is completely free of charge, however there will be a chance to get on the pitch for the ‘Bet 888 Shoot-out – £1 a go’, as well as a raffle, all proceeds to go towards supporting families and children. But the fun doesn’t stop there, we also have lots of other surprises in store, including a few footballer faces you may recognise!! Please register your free attendance using the online application form, whether you are spectating, playing or would like to volunteer your time for the day.